The Specification was known as the N.A.39 (its official number was M.148T) and Blackburn, once their tender was accepted, were given just under three years to get the first aircraft into the air, the target date for first flight being April 1958. To speed development, the Ministry of Supply ordered a large batch of twenty pre-production aircraft, enough to carry out all the aerodynamic and engine development, the systems and weapons development and to equip the I.F.T.U. with the Navy. Flight development brought about alterations as problems were encountered, and solved. A flutter problem was discovered in the high tailplane and fixed by the installation of inertia weights in the tailplane tips. Originally the aircraft had been intended to have a retractable flight-refuelling probe but this was found unsatisfactory and a removable probe was standardised. 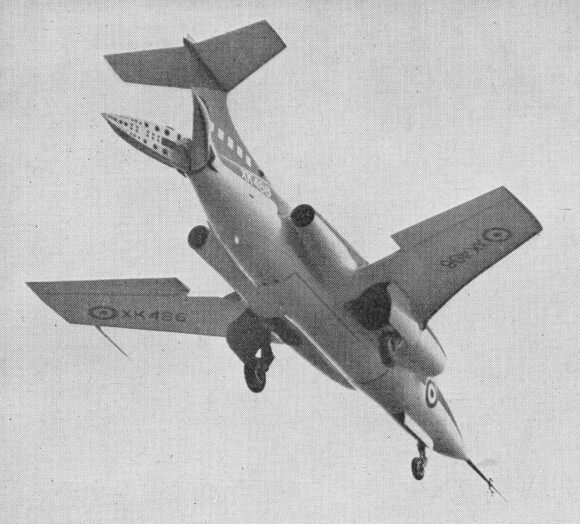 On 30th April 1958 Derek Whitehead took XK486, the first Blackburn N.A.39, on its maiden flight from the R.A.E. airfield at Thurleigh, Beds. Initially the Buccaneer was powered by two D.H. Gyron Juniors. The twenty aircraft ordered and given the serial numbers XK486-XK491 and XK523-XK536 inclusive, and nine of these were to be used primarily by Blackburn's for development of the whole weapons system, five were for Ministry of Supply trials work, and six for the Royal Navy for use by the Intensive Flying Trials Unit. 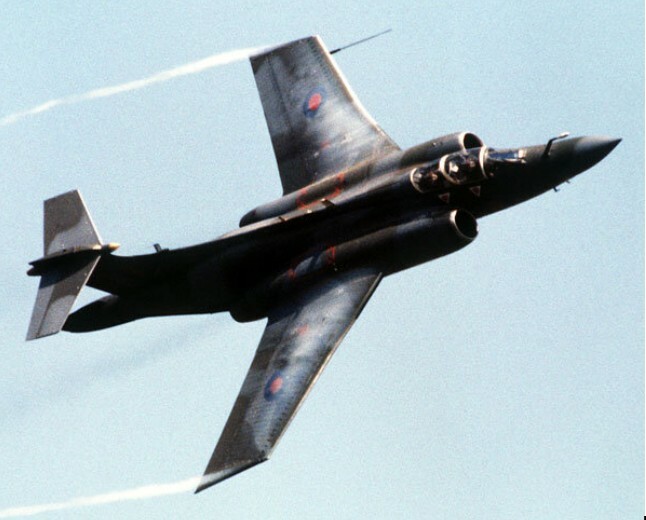 The first navalised Buccaneer appeared in January 1959, an interim naval aircraft, but with arrester hook and folding wings. In September 1958 a production contract for forty Buccaneer S.1 aircraft was signed and they were allocated the serial numbers XN922-XN935, XN948-XN973. The Buccaneer features mid-set wings with compound sweepback, swept tail services, with tailplane mounted at the top of the fin. The ailerons droop to supplement flaps during landing. Air is blown over wings, ailerons, flaps and tailplane to reduce take-off and landing speeds. The tail-cone splits along the centreline to act as an airbrake. The outer wings fold upwards for stowage on board ships. The whole production run came out of Brough between July 1962 and December 1963. The Buccaneer S.1 entered operational service with the Royal Navy in July 1962. Able to carry an 8,000 lb (3,628 kg) load of conventional or nuclear weapons, distributed between internal stowage and underwing pylons, it was superseded by the more powerful Spey-engined Buccaneer S.2 in October 1965. In August 1964 it was reported that South Africa, rebuffed by the US State Department in bid to buy Grumman Intruders because of its race policies, was buying British Buccaneers instead. Although the Buccaneer S.1 had proved reasonably satisfactory, certain drawbacks came to light during its service. These centred around the Gyron Junior engine. The first was that, with the possibility of an engine failure on take-off or landing (when the full BLC blow was operating), the single-engine performance of the aircraft was critical; the second disadvantage was lack of range. Hawker Siddeley re-engined the aircraft with Rolls-Royce Speys. 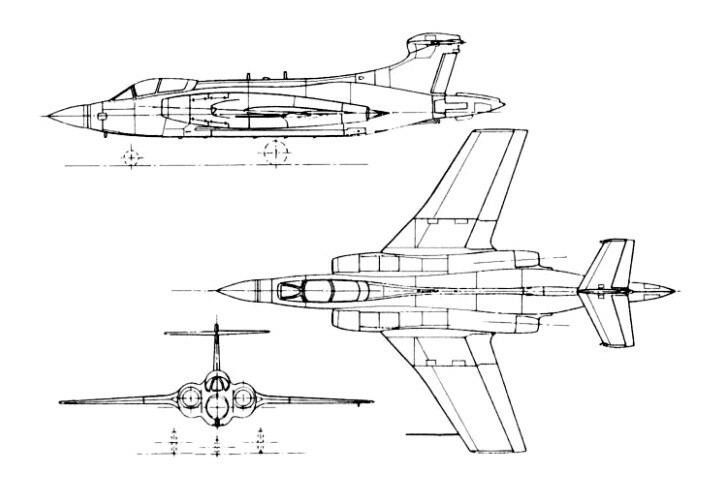 Two of the DB machines were returned from Ministry of Supply trials work for modification into the prototypes for the new Spey-engined version, to be known as the Buccaneer S.2. These aircraft were XK526 and XK527; the former flew first in the new configuration on 17th May 1963, being followed by the second on 19th August 1963. The first batch of ten production aircraft had by then been ordered and given he serials XN974-XN1983. The first of these was completed and flown a year later on 6th June 1964, by which time the first two prototypes were completing a satisfactory programme of development flying. XN974 was the first production S.2 aircraft, making its first flight from the British Aerospace airfield at Holme-on-Spalding Moor on 5 June 1964. It went straight to the Royal Aeronautical Establishment, Bedford, for work trials and then to HMS Eagle for sea trials. In 1965 it went to the USA for hot weather testing and achieved a record on its return flight from Goose Bay to Lossiemouth by becoming the first Fleet Air Arm aircraft to fly the transatlantic route non-stop without refuelling; on 4 October 1965, completing the 1,950 miles (3,138 km) between Goose Bay, Labrador, and Lossiemouth, Scotland, in 4 hrs 16 mins. Four of this batch went for R. & D. work, XN974, '975, '976 and '983. XN975 and XN974 flew the Boscombe trials, the former doing the deck-landing trials in several stints aboard Ark Royal. Eighty-four production Buccaneer S.2s were built in the years that followed with the following serial allocations: XN974 to XN983; XT269 to XT288; XV152 to XV168; XV332 to XV361; and XV863 to XV869. 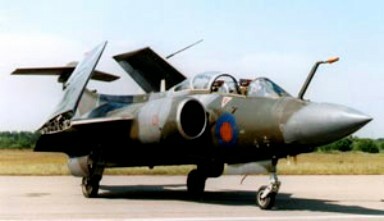 The first operational Buccaneer S.2 squadron was No. 801 which served aboard H.M.S. Victorious. During the early 1970s the Buccaneer was acquired for the R.A.F. and was equipped to use the Martel air-to-surface missile. 43 new S.Mk 2Bs were built for the RAF, the last of them delivered in 1977. This development provided a spin-off for the Royal Navy and in the mid-1970s the F.A.A. 's Buccaneers were re-designated as S.2C (non-Martel) and S.2D (Martel-equipped). This gave the squadron a greatly enhanced anti-ship capability and in September 1974 the squadron embarked for the first time in Ark Royal with a full complement of S.2Ds. The squadron began its last commission in April 1978. On 27th November 1978 No. 809 took off from Ark Royal for the last time, in the Mediterranean, flew its aircraft direct to the R.A.F. Maintenance Unit at St. Athan, and disbanded there. It left FAA service with the decommissioning of HMS Ark Royal in 1978, with the remaining 62 examples being transferred to the RAF. The last squadrons were disbanded in 1993. From 1972 two squadrons of Buccaneers served in RAF Germany until replaced by Tornados in 1984. Maritime strike/attack and reconnaissance then became the aircraft's primary role, along with the secondary task of carrying laser designator equipment for precision attacks. South Africa operated 16 of the S.50 version from 1965 to 1991. A total of 144 aircraft were built for the Royal Navy. Royal Air Force Buccaneers first saw combat during the 1990-91 Gulf War (Operation 'Granby'), 22 years after entering service. Twelve Buccaneers were deployed at short notice to the Gulf during Operation 'Granby' to designate targets for Royal Air Force Tornados and Jaguars. Although the Buccaneer was seen in 1969 as an interim type pending the development of the Panavia Tornado, the last examples were not retired until March 1994. Engines: 2 x de Havilland Gyron turbojet, 7100 lb. Wing span: 44 ft 0 in (13.41 m). Length: 63 ft 5 in (19.33 m). Height: 16 ft 3 in (4.95 m). Max TO wt: 45,000 lb (20,412 kg). Max level speed: 720 mph ( 1159 kph). Wing span: 13.4m (44 ft). Hardpoints: 4. Engines: two Rolls-Royce RB Spey Mk.101 turbofans, 11,100 lb thrust. Engine: two 11,100 lb, 50.4kN thrust Rolls-Royce RB 168-1A Spey Mk 101 turbofan. Max internal /external weapon load: 16,000 lb (7,257 kg). Wing span: 13.4m (44 ft).